If you follow my posts at all, you’ll have learned a little something about me. I have this weird thing where I eat a delicious something – at a restaurant, from a bakery, or from the store – and I become a little obsessed with recreating it at home. I mean, why bother when you can just drive to the place you had the original and enjoy it there? 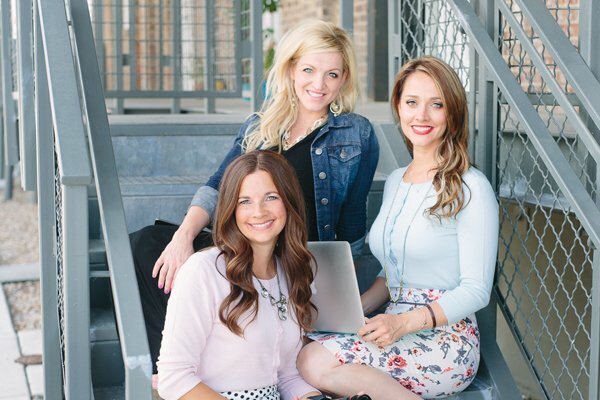 For me, it comes down to three things. First – cost. It’s often a much cheaper way to enjoy a food I love to make it myself at home. This recipe is no exception. Second – convenience. Many places I have tried something delicious are not located nearby and it’s much more convenient to be able to make the recipe at home. Third – satisfaction. Is there anything better than learning something new? Especially when that something new is scrumdiddlyumptious? A while back my daughter had an off day and her friends popped by with some goodies from a local bakery. 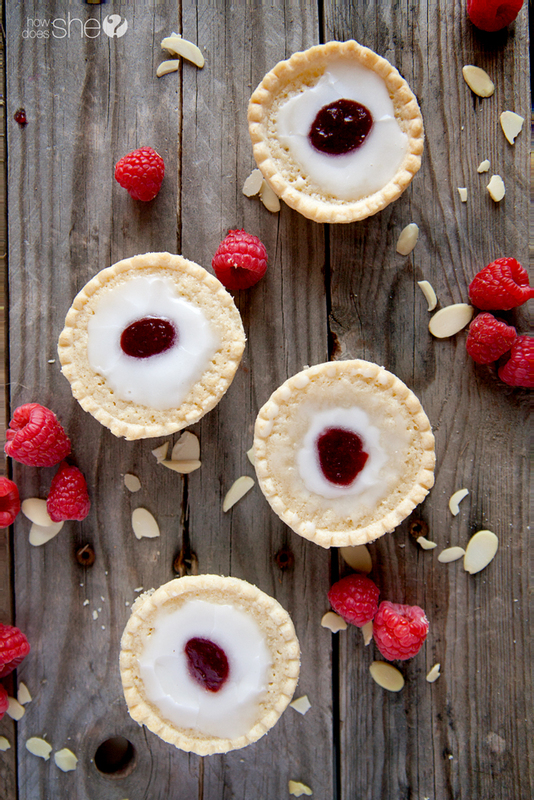 One of those goodies were some little tarts with a dollop of raspberry jam on top and I just had to taste one. It was love at first bite. I’m not usually a tart girl. It used to be that you could give me a cookie or doughnut over a tart any day and I’d be smiling. But now – I might just be a tart convert. You guys, I was dreaming of these things. I had to head to the bakery and buy some once (or twice). I just knew I had found a new challenge – figure out how to make these at home. And guess what? I did!! And now, because I love to share – I’m sharing my easy recipe with you!! Mix together the butter, sugar, flour, salt (if using), 1 tsp almond extract and 1 tsp vanilla extract until smooth. Add in the eggs to the butter mixture, beating after each addition. Add the almond flour to the butter mixture and stir just until combined. This completes the almond filling. Add the almond filling over the raspberry jam layer in each tart filling the shell about 3/4 of the way – the filling rises a tiny bit when cooking. Bake for 20 minutes, or until the filling is set. Once the tarts have cooled, spoon about a half tsp of the glaze over each tart, and add a dollup of raspberry jam to the center of each tart. Let the glaze set up and enjoy! 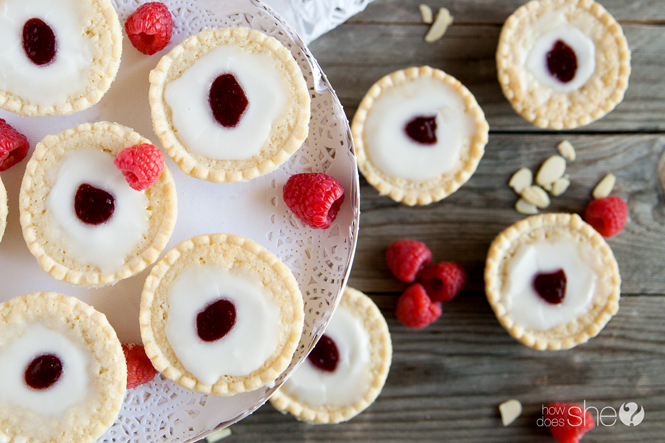 Tarts make the perfect take along for potluck meals – individual servings are the best! These freeze well, so make some, freeze them, and have them on hand for those last second visitors or dinner invites. I mean, if you can manage to not gobble them all up first. This recipe has the perfect balance of tartness and sweetness – a match made in happy mouth heaven! Try it out and let me know what you think! 1/2 cup raspberry jam approximately - you may use a little more or less depending on how generous you are with it. Add the almond filling over the raspberry jam layer in each tart filling the shell about 3/4 of the way - the filling rises a tiny bit when cooking. 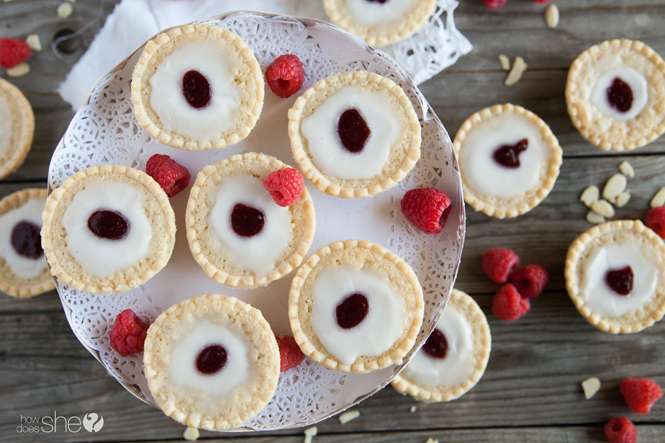 Once the tarts have cooled, spoon about a half tsp of the glaze over each tart, and add a dollop of raspberry jam to the center of each tart. 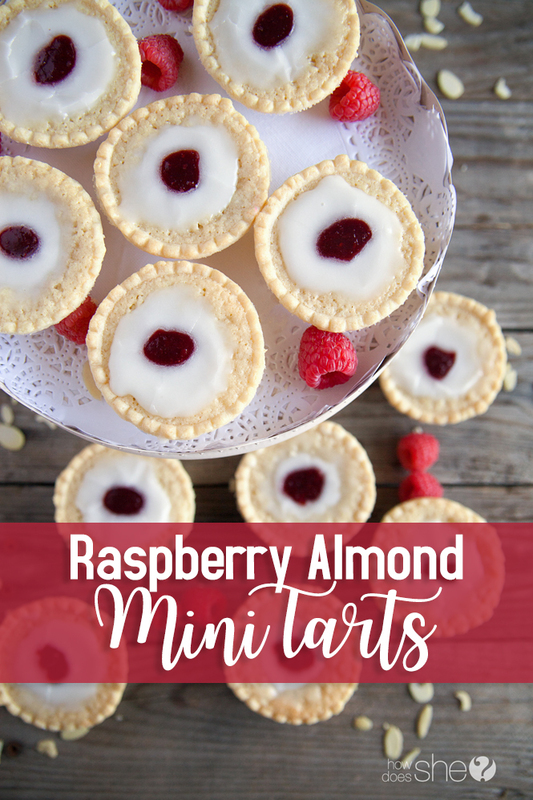 I used to have a recipe for delicious little almond tarts and have mourned the loss of the recipe, cursing myself for my carelessness. Your almond filling looks and sounds like the filling from my recipe. And you’ve added glaze AND raspberry jam! Thank you, thank you, thank you! I live in Southern California and I am having trouble finding the frozen mini tart shells. Please tell me the brand you used.